Written by Mike A. Richardson for the ZX Spectrum. Converted for the Amstrad CPC by Nick Wilson and Mike A. Richardson. Spectrum and Amstrad loading screen by Dave Cummings. Converted for the Commodore 64 in 1986; credits unknown. A lot of you might know how this one will end before it even begins, but let us just say, this entry is an introduction to the game for those of you readers who have for some reason never really tried this game out properly. Myself included, in fact. Durell's Turbo Esprit can be called the progenitor for games like Grand Theft Auto for a good reason, as it was the first free-roaming 3D driving game ever. The reason why I never got around to properly give it a try is mostly because I missed the greatest hype period when it was new, and later on, the look of it just never really appealed to me. I'm not even much of a fan of the GTA series. But now, because I had the feeling the Spectrum was once again getting left out of the spotlight, I decided I would finally give it a proper go, and give an honest review of how the game feels for a beginner, 28 years after the game was released, and compare the three releases while at it. Old reviews might give some indication as to what sort of results might await at the end: Zzap!64 gave the C64 version a massively disappointing 9% in their review in issue 49, while Sinclair User gave the Spectrum version a full 5 stars and Your Sinclair gave it a 9 out of 10. Lemon64 users have given 23 votes for the C64 version, and the rating is currently 3.4, while 473 WoS'ers have given the Spectrum version a whopping 8.50. The only score, old or new, I found for the Amstrad version was at CPC Softs website, which had a 14.38 out of 20.00. I suppose the results are quite clear already, but let's take you through the details. Released in May 1986, Turbo Esprit was in many ways ahead of its time. As the title would suggest, the game concentrates on driving a car around, but this was the first free-roaming, behind-viewed 3D driving game. And I do have to make the distinction about the perspective, since Atari 2600 had Getaway! a few years before this one came out. More precisely, the game utilises a very strange combination of dashboard view at the bottom half of the screen and a 3rd person view at the top half. But that's only one part of the deal - you also get car indicator lights, pedestrians and traffic lights, and as many as four cities to drive around in. Naturally, being located in England, the traffic is on the left side, so you need to take that into account when driving around. This makes adjustment to the game surprisingly difficult for us foreigners who drive on the right side - or the WRONG side, as Jeremy Clarkson puts it. The object of the game is to track down cars of drug smugglers and either destroy them or ram them into submission, depending on what kind of car are you up against. You are a special agent behind the wheel of a Lotus Esprit Turbo, equipped with a machine gun and a message display that will give you occasional information from the headquarters. As you are supposed to be portraying one of the good ones, you will be given penalties for hitting scenery or civilian vehicles. 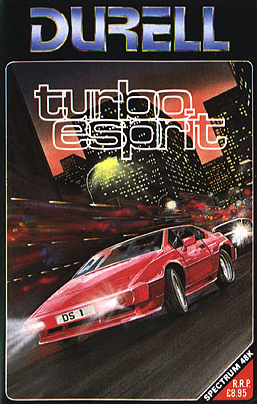 Wikipedia says, that according to author Mike Richardson, Turbo Esprit took 10 months to develop, the longest time he ever spent on a single game. It was developed with the cooperation of Lotus Cars Ltd., who provided "technical assistance", whatever that means. Comparing this to more modern games with single developers, it's not all that long a time, but for the time, it must have felt like an eternity. Happily, the time spent on the project shows quite well in all the details, and to some extent even playability, although today it naturally feels extremely primitive and awkward, at least when compared to modern 3rd person 3D driving games. It is sadly quite possible, that I, for one, will never be able to enjoy this game properly, for many reasons. First off, I have very rarely gotten behind the wheel of a real car, and I don't have a driver's licence. Therefore, I might have some problems with traffic rules, particularly when I have to concentrate on relatively badly flowing simulated traffic that goes on the left side. I also don't like following real-life traffic laws in games, particularly if my mission is to catch bad guys in high speed. It just feels like the dream combination for a masochist gamer. But I might well be in the minority here. Anyway, if it were 1986, I would probably recommend Turbo Esprit wholeheartedly, but if you didn't grow up with this game, I would still say that you might as well take a look at it, because it is such an important piece of gaming history, but don't be too surprised if your initial experience ends in disappointment. Although Turbo Esprit has been released in disk format as well as cassette, mostly due to the cassette being the predominant format in Europe, the loading times will be compared from the tapes, and only the quickest loaders will be mentioned here. For those of you, who haven't read my earlier entries with disk loading time comparisons included, I will only say that the Amstrad and Spectrum disk versions seem to load superbly fast compared to the C64 disks, and leave it at that. Loading screens, left to right: Commodore 64, Amstrad CPC, ZX Spectrum. Actually, the Spanish Erbe Software release for the Spectrum loads one second quicker than the original Durell UK release, but since the Erbe version is Spanish, most of you readers will probably not be interested in that one. Also noteworthy is that the original Durell release on the Spectrum has some sort of custom loading scheme on side 1 that will not load on 128k machines, so the 128k Spectrum users will need to use side 2, which takes a bit longer to load, or alternately, buy the Encore re-release. Once the game has loaded in, you will get to choose one of four cities you will be driving in. This, in its own way, acts as a sort of additional difficulty level setting. Unfortunately, you cannot change the city once you have chosen it, unless you reset the computer and reload the game. From the main menu, you can choose your control method, view the high scores (and penalty scores), change the difficulty level, and start either a practice game or a regular game. All the versions have the same basic controls setup. You can choose to play with either a joystick or keyboard, although the Spectrum version is the only one, in which you can redefine the playing keys. Up and down will accelerate and decelerate your Lotus, and you can even go reverse with the car if you require to. Left and right on their own will strafe through the lanes, and pushing the fire button while moving left or right will make your car turn into your specified direction. You can even move on to the sidewalks, since that is where you need to pull over to, if you need to stop at a petrol station. The Esprit is quite quick to handle, so you need to be careful when turning, lest you bump into another car, a traffic light, or a pedestrian. As mentioned previously, all the unnecessary collisions will give you penalty score. Fire button on its own will shoot your machine gun, which will help you bring down the drug smugglers. The M button will toggle the map screen by default, and naturally, you can choose your own map key on the Spectrum. The other default key mappings are J and L for left and right, K for fire, A and S for acceleration and deceleration/reversing, and T for suicide. What might have once been a revolutionary control method, is ultimately what brings Turbo Esprit down for me now. The biggest problem with the game engine is the way your viewpoint changes every time you supposedly turn your car onto another street. It takes a good while to get used to the turning cycle, which is surprisingly quick, and sometimes, your viewpoint changes even if you haven't completely managed to turn to the new lane properly, due to crashing into an on-coming vehicle which you couldn't see, or some other similar reason. One of the most problematic issues about this game, however, is that your viewpoint doesn't change to the front of the car when you drive in reverse, so you have no idea if you're backing up onto other cars behind you. This is something you would take for granted nowadays due to games like Grand Theft Auto (3 onwards). Before you know the city maps by heart, you will have quite a lot of trouble getting anywhere in the game, so it's really easier to find a city you are most comfortable with in the beginning, and practice a good half an hour before you actually try your hand at chasing down drug smugglers. Another thing that doesn't exactly help to improve the playing experience is how the map works. The game doesn't pause while you're in the map, which is okay in games like Carmageddon, where you get a miniature action window in some corner of the full map screen to see what's actually happening in the game. Sure, it helps to get to know the areas more easily, although I would have preferred to have the maps within the game manual as well as in the game. Also, while you're in the map, you cannot control the car - you will continue moving the same speed in which you left your Esprit moving before you switched on to the map mode, and the risk of bumping into other cars is immense. Instead, the controls will move the map around. None of this would make such a big deal, if the map ever worked instantaneously, but since toggling the map has a certain amount of lag, it feels unresponsive, and often you will be unintentionally scrolling the map while you were trying to control the car. I did test this on real hardware as well (Spectrum and C64), so it's not just an emulation-related problem. Still, all things considered, the game plays surprisingly well, at least on its original platform, the ZX Spectrum. The sense of urgency and the need for expert skills for navigation and handling your vehicle have been programmed very well indeed for its age, even if it all feels a bit uncomfortable compared to modern games. The C64 version performs quite poorly in comparison - there is no sense of speed whatsoever, and the lack of speed reflects in the gameplay. Even when I turned the emulation speed to 200%, the game still progressed painfully slowly, as although the game speed now was closer to the original Spectrum version, everything still moved on the map at least 5 times slower than in the original. If you happen to be the kind of virtual police officer, that more enjoys the coffee and doughnuts side of the job, then this might be more suited to you. The Amstrad version is happily closer to the Spectrum version, but the 3D scrolling gets more sluggish more quickly, when there are too many other moving objects on the screen. Since Turbo Esprit essentially tries to act like a 3D polygon game, at least when it comes to all the roads and buildings, you cannot expect too much graphical detail from the game. The buildings are of a few different heights, but that is the only characteristic that you can make out of the blocks by both sides of the roads. Other little things you can see occasionally are pedestrians (white or black stick figure people, depending on the version), lamp posts, traffic lights, petrol stations and roadworks. Trying to spot these little details can be fun, since the game has no details at all in buildings. All the road markings are surprisingly well made, and it is rather surprising to see, how lawfully all the civilians drive around. The most important things in the game are, of course, all the cars. In the original Spectrum version, all the other cars are black (including your Lotus), except for those used by the drug smugglers. The delivery cars (of which there are four in each game) are blue; the armoured supply car is red, and the "hit" cars are coloured magenta. The Amstrad and Commodore versions share the same car colours: your Lotus is red, as are the delivery cars; the supply car is black, the "hit" cars are white, and all the civilian cars are yellow and blue. Although I would normally say that more colour is better, I have to agree with the original colour scheme, because trying to follow too many different colours around can be extremely diverting. Also, the amount of detail and animation on the Spectrum is easily the most eye-pleasing of the three. Although most of the same details exist in all three versions, they are more difficult to come by in either of the two conversions, and due to blockier graphics, more difficult to see. Any bigger amount of action on the Amstrad screen renders taking good screenshots nearly impossible, as you can see from the shot with a car exploding. Finally, the map screen, which is just as important as the main action screen, differs surprisingly lot in each version. Although the C64 version seems to be the easiest one to read by a quick look, I'm not entirely sure it's the most informative one, even if it shows the biggest area of the three. The Amstrad map screen gives the least amount of information regarding street numbers, but at least it shows the petrol stations much like the Spectrum version. The Spectrum version is the easiest to scroll through, and shows all the necessary information, but doesn't show as much area in one screen as the C64 version. The most important thing about the map is how quickly can you locate the drug smugglers without smashing into another car, so I would say the C64 version has the best map in that sense. It's just a pity that the speed of the game ruins the whole thing. All in all, I would have to say the original wins here, quite easily even, and the Amstrad version wins over the C64 version in balance. It's difficult to say, which one of these soundtracks is the best, since I'm not really all that fond of any of them. 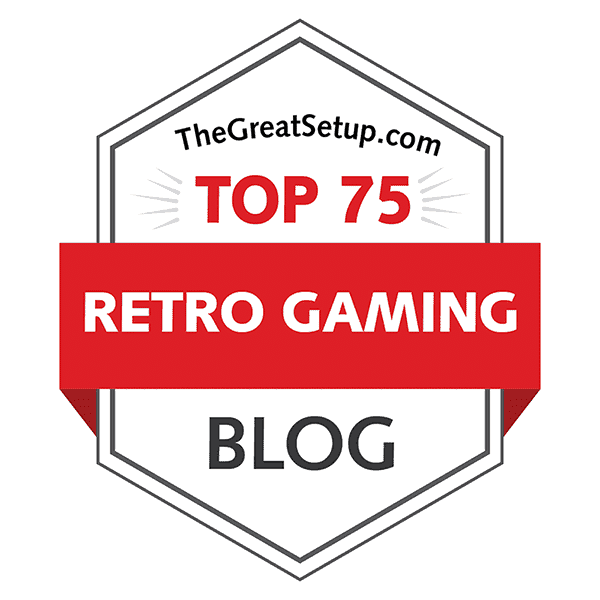 When there is very little nostalgy involved when writing a retro game review, all you can do is trust your instincts and education. Turbo Esprit only has one theme song, which is a cheerful one-minute tune, after which it loops. The Spectrum version has been made to play chord arpeggios very quickly, in order to get an illusion of multi-tonal music. It doesn't sound very comfortable, but you do get the idea of how it's supposed to sound like. Also, the first melody bit plays in a higher single beep style when you start the game, which is a unique feature on the Spectrum. The in-game sound effects are very much what you would expect from the 48k Spectrum: screechy, staccato, quick farty noises of different pitches, but you get no engine droning. At least it's all well-placed. The Amstrad soundtrack gets it only slightly better, if you can call it that. The theme tune plays on three very static square tones, and is slightly quicker than the original. For any "normal" ear, this already sounds a bit better. The in-game sound effects aren't all that good, however. You do get the engine drone now, which doesn't differ all too much in either volume or pitch, both of which are low. In comparison, all the other sound effects are stupidly loud, and will make your ears bleed, so it's definitely better not to hear the engine drone. There aren't too many sound effects to hear, but considering the harrowing quality or the few that are there, perhaps one should be glad for the lack of them. At least here, the C64 version can shine a bit. The theme tune is easy on the ears, with a similar arrangement as what the Amstrad version had, but with more sophisticated instrumentation. Perhaps it's not as energetic as the original in all its harshness, but it is quicker and less pushy on the ears. Still, one has to consider the amount of time that will be spent on the title screen compared to the time spent in the game itself. The in-game sound effects here are fairly boring - the amount of effects is similar to the Amstrad, but are more balanced. Even the engine drone is quite a lot better here, but it still gets boring very quickly due to the game's unplayability. Overall, I would still have to say the Spectrum version is more interesting to listen to in the long run, and even the theme tune doesn't sound as bad as it could. One of the more recent "vogue" things to do in the retro programming scenes is to enhance upon old games - perhaps even to the extent that the game code itself is almost completely rehauled. One such thing happened very recently on the C64 scene with one particular classic game, of which I will write about in my next updates entry in a couple of months. Then, a forum thread at Lemon64 got me thinking: if people keep remaking old arcade conversions for old computers, why not make new conversions of old games that didn't really pull it off the first time around? Here's to hoping some coders with talent might take this game and remake it - even enhance it, if possible. Although Turbo Esprit is the most well-regarded game in Mike Richardson's catalogue at World of Spectrum, I would also urge people to take a closer look at some of his other very fine titles: Scuba Dive, Thanatos and Sigma 7 for starters. It's as fine a way to spend some lazy summer days as any other. Next up, a very special episode of Unique Games, so stay tuned! I played this game (Amstrad CPC Version) about one or two years after its original release. Unfortunately there never was any hype surrounding this title. And even back then we noticed the problems of the controls very well and died endless times because of it. But still, I know it may sound stupid, somehow we could see/feel how far ahead of its time this game really was. It’s a pity that Durell only created games for four years and later went on to produce business software instead. They were a great gaming company with many extremely talented programmers/game designers. And of course they created many really great games. But let’s take a look at your comparison. A few weeks ago I promised to write some comments about comparisons that, at least from my point of view, show some unfair treatment of the Amstrad CPC versions of games. I’m sorry that this will be a long read and I know that because of my poor english it might be hard to understand it at times. But please give me a chance. I will stay true to the facts and of course you will easily be able to double check everything. I will only compare the Spectrum and the Amstrad Versions of this game; as you know the c64 version is simply a mess and can be ignored. The first thing I noticed was your comment regarding the colors of the cars. You preferred the Spectrum version, because you felt like following many different colors (CPC Version) could be extremely diverting. To be honest, I don’t get this one. If it’s diverting wouldn’t that be a good thing? This is a car chase game. Your only objectives are to find the criminals, to follow them and to finally stop them. Everything that makes this more challenging is actually very welcome and adds to the gameplay. More colors for the cars -> makes it harder to find and follow the bad guys = very good. Think about a real life situation, you wouldn’t expect the crooks to help you by driving the only not black colored car in the whole town, right? At least in my opinion the color scheme used for the conversations of the game should be the preferred one. But your preference for the Speccys color scheme is interesting for another reason too. Please keep in mind that this color scheme was never meant to make it easier to follow the cars of the bad guys. It only exists because of the limited and inferior (compared to the c64 and the CPC) graphics hardware of the spectrum. If you take a closer look at the color scheme of the spectrum version we can easily point out a few things that are much better in the Amstrad version of the game. So let’s do it. We know that Mike Richardson is a very talented programmer. He knew about the Speccys limited graphics and he knew that a game like Turbo Esprit would look horrible if he would actually try to use colorful graphics to create the city. Plus it would become unplayable in that case. The main reason for that is the so called Attribute Clash (or color clash) which is one of the worst features of the Spectrum hardware. It’s important to notice that Attribute Clash is in fact a hardware limitation, even if some die hard Speccy fans still refuse to accept this. This problem is almost exclusive to the Spectrum and it is well known and well documented since the first release of the Spectrum Hardware. The C64 and the Amstrad CPC don’t have this problem at all. If Richardson would have created a colorful city for the Spectrum, the Attribute Clash would have been all over the place. Just take a look at the Attribute Clash of the red and blue cars of the bad guys that is still present in the Speccy Version. Now imagine what would have happened if all cars and all pedestrians would cause the same problems. I think you get the idea (if not, simply take a look at the Spectrum version of Altered Beast). It’s easy to see that Richardson had to use a workaround to prevent the Attribute Clash. There are many of those workarounds, but most of them (especially the ones that are highly praised by Speccy fans) are extremely limited. He finally used a well-known workaround and rendered most of the graphics monochrome (using only two colors). If you take a look at it, the whole city (with the exception of the sky) is drawn in black and white, same for the most cars. This works out pretty good, but even with this workaround the Attribute Clash is still there. It’s easy to notice at the grey colored Walls that appear at the side of tall buildings, at crossroads or at dead end streets. They Clash against the blue color of the sky and the result looks pretty bad. The Clash is still there for almost all other objects too, but it’ very well hidden. Plus, explosions still show the Attribute Clash very much like the blue and red cars. Even if Richardson did a very good job, the Speccy Version suffers from the considerable Attribute Clash that is clearly visible all the time. Of course, the Amstrad version has no Attribute Clash at all. But there is more. All Attribute Clash workarounds come at a cost. It’s always a tradeoff. You can (almost) solve one problem, but that causes some new problems. And in the case of Turbo Esprit it is a pretty bad tradeoff. The question is how to visibly render a black foreground object against an almost black background. Take a look at all sidewalk related objects. For example, the pedestrians are black and they are walking on a black and white colored sidewalk. You need another workaround to make them visible. Because of this all objects are surrounded by a white border (only on the Speccy). This looks very strange and it causes, jet again, even more problems. While you forgot to talk about the weaknesses of the Spectrum Version (Attribute Clash), that didn’t stop you to talk about the strength of it. ;-) Of course I’m talking about the higher resolution (less blockier graphics). But this time around you definitely should risk a second look before start praising this feature. I guess you will (most likely) be surprised. By the way, you wrote that many details are better to see in Spectrum Version because of the higher resolution, but that’s not always true. Some details are only better visible because of those stupid white frames. Since the Amstrad uses the 16 color mode (Mode 0), the resolution of the CPC version is lower than the resolution of the Speccy version. I theory this should be a big advantage for the Speccy, especially in a (pseudo) 3D game. Objects that are far away from the camera should be more detailed on the Spectrum and they should be easier to spot. But surprisingly that’s not the case. In fact, only the objects that are close to the camera are more detailed/less blocky. All other objects are sharper/more detailed in the Amstrad Version. How is that even possible? Well, it’s possible because of the white frames around the objects in the Speccy version. The white frames (they are all around the black cars, the pedestrians, the street lights and the traffic lights) use a lot of pixels. These pixels are only white and cannot be used to draw any new details. Plus, they cover existing details in the background. In the end this causes a loss of the detail that the player can actually see and it destroys the advantage of the higher resolution. And it leads to jet another problem. Even if both versions pretty clearly are able to render an identical draw distance the Amstrad seems to have a noticeable better draw distance. Far away walls seem to suffer from some sort of pop up problem on the Spectrum. Once again, this happens only because of those white pixels that cover other details. Because of this the draw distance (at least the part of it that is visible for the player) is indeed better on the Amstrad. I should have written white borders, not white frames. I'm sorry for that. If you don’t care about the far away objects, well this has an effect on other objects too. Take a look at the traffic lights for example. The traffic lights seem to be living creatures in the Spectrum version. When they are far away they hover/float over the street (yes the street, not the sidewalk), even if they should stand on the sidewalk. If you get closer they hover/float to the sidewalk, but they are still not connected to the ground. I guess it’s needless to say that the Amstrad does not have any of those problems. The traffic lights are hovering there too, but at least they are always connected to the ground and they are always on the sidewalk. Since the Amstrad Version uses 16 colors there is no need for white borders there. Everything is properly colored and because of this easily visible. Plus, while you cannot really see the stop light while driving with full speed on the Spectrum, but you can easily see the stop light in the Amstrad version (no matter how fast you are driving). That’s simply because it’s actually red there (like it should be). If you keep in mind how fast you can die because of this I would guess that this is at least a pretty neat feature. I’m very thankful that you noticed that all versions show a comparable level of detail. Most Spectrum user still spread the urban myth that the Speccy version is the most detailed one. While that is definitely not true, there are still some subtle differences. For example, the turn signals (“blinkers”) work on both versions. But only the Spectrum Version renders a working blinker on the car. The Amstrad version only shows the blinker on the dashboard. But on the other side the Amstrad renders some details that are completely missing on the Spectrum. Most noticeably, the Amstrad has three different types of walls. While there are only white and grey walls on the Spectrum, the walls on the Amstrad have two shades of grey (representing the white and grey walls of the Spectrum), plus there is a grey wall with blue dots on it. This one looks like a wall that has windows in it. It may sound stupid, but because of this (and the colorful cars) the Amstrad citys are less boring than the Speccy ones, which are only build up on endless white walls. Even your own screenshots show this difference quite good. Finally let us take look at something else. Here is a quote from your post: “Any bigger amount of action on the Amstrad screen renders taking good screenshots nearly impossible, as you can see from the shot with a car exploding.” I don’t know what you did there, but I can send you plenty of screenshots (Amstrad) that show a lot of action without the weird tearing effect of your shot. I tried for a few minutes to get a broken screenshot out of my emulator, but it did not work. I guess there is something wrong with your emulator. While the Amstrad version is slower than the speccy version, they both suffer from the same bad framerate and some strange tearing-like effects. You might think faster is always better, but again there is a different point of view to this. The Amstrad version is a little bit slower but it maintains a stable framerate even if there is a lot of action on the screen. The Spectrum Version on the other hand has a little framerate problem (I tried it on the real machines and on emulators for both versions). The framerate drops every time (and it is a pretty bad drop sometimes) you strafe between the lanes of the road. Of course you need to do that all the time, especially when you are chasing the bad guys. 1. Why did you ignore the Attribute Clash? 2. Is this still a clear win for the Speccy? To give you my point of view regarding the second question, I think it’s a draw. Both Versions have their own strength and weaknesses. The playability of both is almost identical. In the end it’s all up to the personal preferences of each gamer. That makes it impossible to choose a winner. Fair enough? Sure, that certainly is fair enough, thanks for the different point of view. My review/comparison was made from the point of view of a person who had never really played the game before, and focused mainly on the aspects which made the initial gameplay experiences as positive as possible, and from my perspective, it just happened to be in the advantage of Spectrum. 1. I probably ignored the attribute clash, because I have grown so accustomed to it that the amount this particular game had of it, didn't really give me the headache some other games do. The Amstrad version may not have attribute clash, and sure, it has more colours, but to a Turbo Esprit beginner, the lack of colours is more comfortable to start with than anything closer to reality. 2. As far as I'm concerned, it is, but perhaps not quite as clear. Considering all you have written above, I do understand the need for a lesser score gap for the two, but you must have realised yourself, that the mathematical results rarely correspond with how the different versions compare in reality. I'd say the placings are the same, but the scores are not what they should be. Not that they ever were, but mathematics don't apply to my reality. =P Anyway, for a gamer more suited towards the Amstrad version, of course that version is better for them. In the end, we both agree on that it's all up to the personal preferences of each gamer, making it impossible to choose a true winner. I have no problem with that - in fact, that's what I've been trying to get across to all readers. My comparison results are only my comparison results, from my point of view, but I try to give them all a fair chance, as far as I'm able to. I guess we (like the most retro gamers) learned to ignore the weaknesses of our favorite systems over the time. Most Speccy user can easily ignore the color clash, while almost every Amstrad user has no problems with the often blocky graphics. It’s funny, isn’t it? And that’s the main problem. The number of systems compared has an influence on the overall score. It gets worse if you combine systems for selected sections only. Maybe you should an “x out of 10 points” system for each section (ignoring the number of compared systems). To keep things simple you could continue to give only full numbered points (no 8.2 or 8.5 scores). Regarding the emulators, well WinApe is considered to be the best Amstrad emulator. It has many features (CPC+ emulation for example) and is a great development tool, too. But to be honest, I never use it. Personally I prefer WinCPC (http://www.wincpc.ch). Sure, feature wise it is not as advanced as WinApe, but I think the emulation is a little bit closer to what you get on the real machine. I even prefer it as development tool. Of course that’s just my opinion. Okay, thanks for the suggestion regarding the emulator, I'll look into it. As for the scores... No worries - I agree, the scoring system raises a problem in many cases. However, I don't think I'll be changing anything (at least not in the near future), because mostly, it's just a method of raising interest, and hopefully make people comment. Math is the problem, but only because it's the wrong sort of math. I have long known I should be using a scale of 1 to 10, but at some point I figured it might not be any more balanced than how the scores are currently counted. More to the point, it still wouldn't say how good any of the games are in terms of each machine, and I have no idea how to give that sort of scores with any reliability, because my knowledge of hardware is almost next to nothing. As an example - I'd probably give Turbo Esprit pretty bad scores all over, particularly conserning graphics, but if I gave the Amstrad version a 5, the Spectrum version a 6 or a 7, and the C64 version a 3, I wouldn't know if they were fair at all; that's only how I feel about them. That's why I use a ranking order, even if it works even worse. If you really want to know where the main focus of the score lies, look at every game's playability score. If a game has bad gameplay, it rarely matters what it looks like or sounds like. Some gamers might think otherwise, but I think that's probably why, for example, Summer Games Part 1 has had more clicks than Part 2 - the playability has been taken care of in Part 1.